Investment mandate: Strategic Public Equity (SPE) – targeting 15% IRR on investments over the long term. 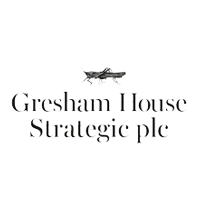 Gresham House Strategic plc (LON: GHS) invests in UK smaller public companies, applying private equity style techniques to construct a focused portfolio. The Manager focuses on profitable, cash generative companies that it believes are intrinsically undervalued, aiming for significant engagement with investee company stakeholders in support of a clear equity value creation plan over the long term. It seems that early 2019 has begun with a continuation of the unrelenting volatility in equity markets that characterised the last quarter of 2018. However, for those that adopt a longer-term value philosophy, the current climate could present an attractive buying opportunity as markets have a habit of surprising consensus. The UK markets, in particular, look increasingly attractive on both an absolute and relative basis and, having experienced a higher level of fund outflows and redemptions in 2018 than in 2008, are exhibiting signs of being oversold. Whilst there are many reasons to remain cautious, both from a UK and wider global perspective, a strategy focused on bottom-up analysis, investing in sound business models with management teams able to drive performance in growing industries through self-help should be capable of generating above average returns in the coming years. With that as a backdrop, we remain optimistic for the performance of the Strategic Public Equity strategy. likelihood that the FED will turn more dovish sooner than currently signalled. The combination of these policy changes in the US and China, should they happen, would be beneficial for equities. Politically, the year seems set to remain highly combative which will lead to continued uncertainty and hence volatility within equity markets. Internationally, the tension between globalisation and nationalism is set to continue. This is true in developed and developing markets and poses political risk to investment in almost all sectors. With the Democrats having won control of the House of Representatives, the Trump administration will find itself increasingly frustrated in pushing through its plans which could lead to further Twitter outbursts and deadlock such as we are already seeing, evidenced by the effective shutdown of the US government. The UK faces a critical few months over Brexit, which will continue to dominate discussion until there is further clarity on what will happen on 29 March. Whilst the majority of MP’s are strongly opposed to a hard Brexit, it is by no means clear that an alternative to Theresa May’s ‘deal’, nor a second referendum, could be achieved or would solve anything in a deeply divided country. Until there is a clearer sense of direction, it is unlikely that investors will increase allocations to UK equities, notwithstanding their relative attractions. Indeed, Q4 of 2018 saw high levels of redemptions from UK equity funds. According to Investment Week , the outflows from All-Cap UK equity funds in 2018 was more than double that of 2008 in absolute terms. Within the investment management industry, a number of factors have had a significant impact. The outflows mentioned above have had an exaggerated impact on actively managed funds, which have continued to suffer from a switch towards lower cost, passive funds. David Kelly, chief strategist at JPMorgan’s $1.7trillion funds arm, states that the market volatility has been exaggerated by these passive and momentum funds which use algorithms to direct buying and selling. In his view, “market swings are not validated by an actual problem in the economy”. We subscribe to this view as, whilst there are clearly signs of a weakening UK and global economy, many of the traditional ‘recession indicators’ remain relatively benign. Yield curves, which often invert ahead of recessions, have flattened, but remain within ‘normal’ limits. The spread on high-yield bonds, which typically widens dramatically ahead of recessions, has widened, but remains below longer-term averages. 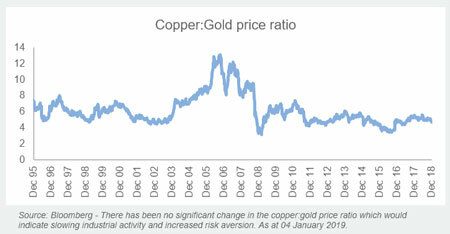 The ratio between the copper price and gold price has not widened as would be expected if commodity demand was falling and risk aversion increasing. Furthermore, economic indicators from unemployment to earnings remain positive. Countering these indicators, the recent fall in oil prices, rising inventory levels and the significant slowdown in M&A activity in Q4 of 2018 are all more typical end-of-cycle indicators. Whilst the market correction was due, it may have been exaggerated. From a valuation perspective, the UK market is now looking attractive and cheaper than most other developed markets and at a significant discount to both the US and major European indices. The long-term PE ratio of the FTSE All Share (sometimes referred to as the ‘CAPE’ or cyclically adjusted price earnings ratio) was 15.62 at the end of December 2018 and is now close to its longer-term average. The valuation represents 35.6% discount to the Dow Jones and 7.6% discount to the DAX. Small-cap shares in the UK have been hit harder by the market correction. The FTSE Small Cap (Excluding Investment Trusts) total return index fell 12.1% and the AIM All share fell 21.5% in Q4 2018, compared to the FTSE All Share which fell 10.2%. Whilst small caps are often regarded as riskier, over the longer term, they have outperformed significantly, and analysis has shown that within a portfolio, volatility (and therefore risk) is no higher than for larger companies. Many small-cap valuations, in our view, now represent compelling buying opportunities and, notwithstanding the mixed economic indicators, appear to be discounting a severe recession. UK small-cap shares are increasingly international and should not be seen as pure UK economy exposure, yet it is evident that the uncertainty surrounding Brexit and its potential impact on the UK economy has had a big impact on the sector. Historically, private equity has played a role in closing valuation anomalies in the small-cap market. Whilst, in aggregate, mid-market private equity funds have substantial uninvested cash, the banking credit has tightened, and M&A activity has slowed significantly in Q4. As a result, the valuation anomalies may persist longer than would normally be the case and investors will need to be patient. In this environment, a supportive, longer-term shareholder base will be an important asset to companies. Finally, the equity bull market since the financial crisis has coincided with an unprecedented period of quantitative easing. It has also been a period where ‘Value’ has underperformed ‘Momentum’ and ‘Growth’ strategies. Monetary tightening through rising interest rates in the US and the cessation of Quantitative Easing (QE) was a major trigger in the market correction in late 2018. Historically, ‘Value’ has outperformed ‘Growth’ and ‘Momentum’, yet this relationship has broken down since the financial crisis. As credit conditions tighten and the money flows from QE stop or reverse, our belief is that ‘Value’ will again prove a sound long-term strategy. The conclusion of all this is that we are likely set for continued volatility in the short to medium term. However, with signs that the UK market may be oversold, driven by high levels of redemptions rather than a fundamental view on valuations, the current environment represents a good opportunity for longer-term investors to find value, focusing on companies with sound business models, incentivised management teams and clear value-creation plans to invest. In particular, the UK small-cap market, with a paucity of analyst coverage, offers valuation opportunities for those willing and able to do their homework. Selectivity will be the key, favouring active fund management and, in particular, those able to invest proactively to support companies over the longer term. Over 25 years’ experience in Public and Private Equity, industry and advisory. This document is issued by Gresham House Strategic plc (“GHS”) for information purposes only. Its contents and any information provided may not be reproduced, redistributed or passed on, directly or indirectly, to any other person or published, in whole or in part, for any purpose, without the consent of GHS. Acceptance of delivery of any part of the document by you constitutes unconditional acceptance of the terms and conditions of this notice. This document does not itself constitute an offer to subscribe for or purchase any interests or other securities. It is not intended to be relied upon as the basis for an investment decision, and is not, and should not be assumed to be, complete. It is provided for information purposes only. Any investment is subject to various risks, none of which are outlined herein. All such risks should be carefully considered by prospective investors before they make any investment decision. You are not entitled to rely on this document and no responsibility is accepted by GHS or any of its directors, officers, partners, members, employees, agents or advisers or any other person for any action taken on the basis of its content. No undertaking, representation, warranty or other assurance, express or implied, is made or given by or on behalf of GHS or any of its respective directors, officers, partners, members, employees, agents or advisers or any other person as to the accuracy or completeness of the information or opinions contained in this Presentation and no responsibility or liability is accepted by any of them for any such information or opinions. Past performance is not indicative of future results. The value of investments may fall as well as rise and investors may not get back the amount invested. Changes in rates of foreign exchange may cause the value of investments to go up or down. No representation is being made that any investment will or is likely to achieve profits or losses similar to those achieved in the past, or that significant losses will be avoided. Prospective investors should seek their own independent financial, tax, legal and other advice before making a decision to invest. The internal rates of return or IRRs presented on a “gross” basis do not reflect any management fees, carried interest, taxes and allocable expenses of the kind that will be borne by investors in a fund, which in the aggregate may be substantial. Prospective investors are reminded that the actual performance realised will depend on numerous factors and circumstances some of which will be personal to the investor. Statements contained in this document that are not historical facts are based on current expectations, estimates, projections, opinions and beliefs of GHS. Such statements involve known and unknown risks, uncertainties and other factors, and undue reliance should not be placed thereon. In addition, this document contains “forward-looking statements.” Actual events or results or the actual performance of the Fund may differ materially from those reflected or contemplated in such forward-looking statements. Certain economic and market information contained herein has been obtained from published sources prepared by third parties and in certain cases has not been updated to the date hereof. While such sources are believedto be reliable, neither GHS nor any of its directors, partners, members, officers, employees, advisers or agents assumes any responsibility for the accuracy or completeness of such information. No person, especially those who do not have professional experience in matters relating to investments, must rely on the contents of this document. If you are in any doubt as to the matters contained in this document you should seek independent advice where necessary. This document has not been submitted to or approved by the securities regulatory authority of any state or jurisdiction.For the Attention of United Kingdom Investors: This document is intended for distribution in the United Kingdom only to persons who: (i) have professional experience in matters relating to investments, who are investment professionals, high net worth companies, high net worth unincorporated associations or partnerships or trustees of high value trusts, and investment personnel of any of the foregoing (each within the meaning of the Financial Services and Markets Act 2000 (Financial Promotion) Order 2005). For the Attention of Investors outside the United Kingdom: This document relates to an Alternative Investment Fund within the meaning of the Alternative Investment Fund Managers Directive and the availability of this document will be subject to registration in relevant jurisdictions as described in the documents relating thereto. Any dissemination or unauthorised use of this document outside the United Kingdom by any person or entity is strictly prohibited. Click Brexit FTSE All Share FTSE Small Cap GHS JP Morgan for the full archive.